Toy Story Land is as great as you might imagine it to be. And then maybe more. 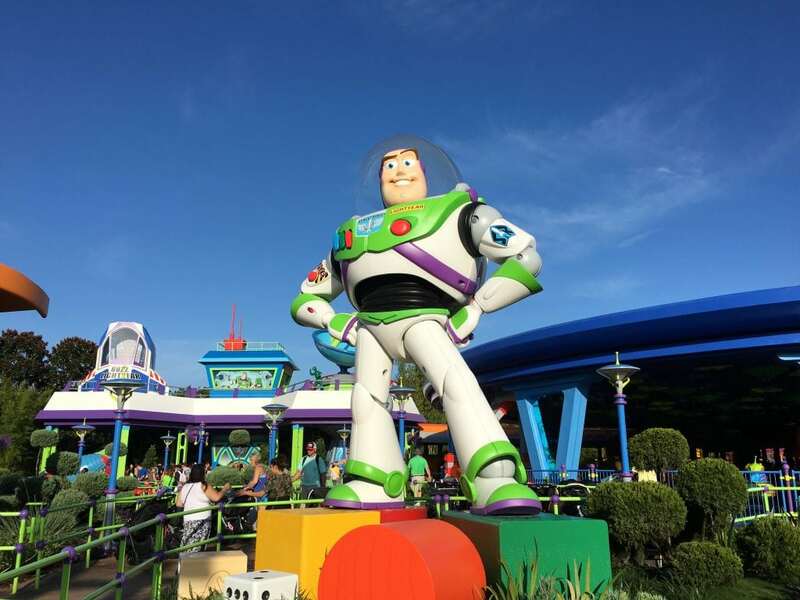 During a recent media visit, where Disney World gave us tickets to explore Toy Story Land’s attractions and food, we were completely amazed by this new land at Disney’s Hollywood Studios celebrating the Disney-Pixar Toy Story movies. 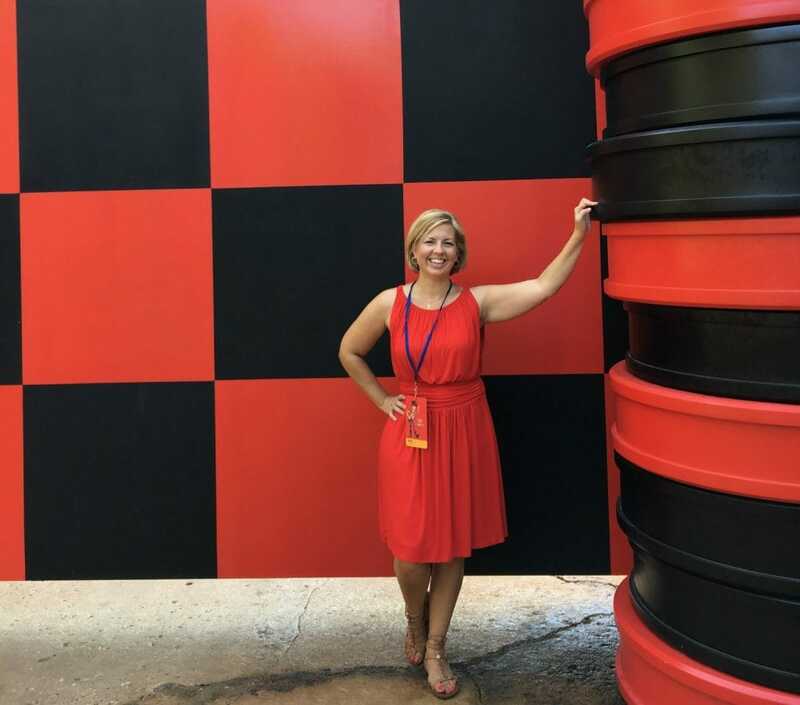 This might be the cutest, most colorful and most playful land at Walt Disney World. We say that in ALL honesty. Visiting Toy Story Land is a completely immersive experience. Everything all around you is toy-sized and incredibly themed. 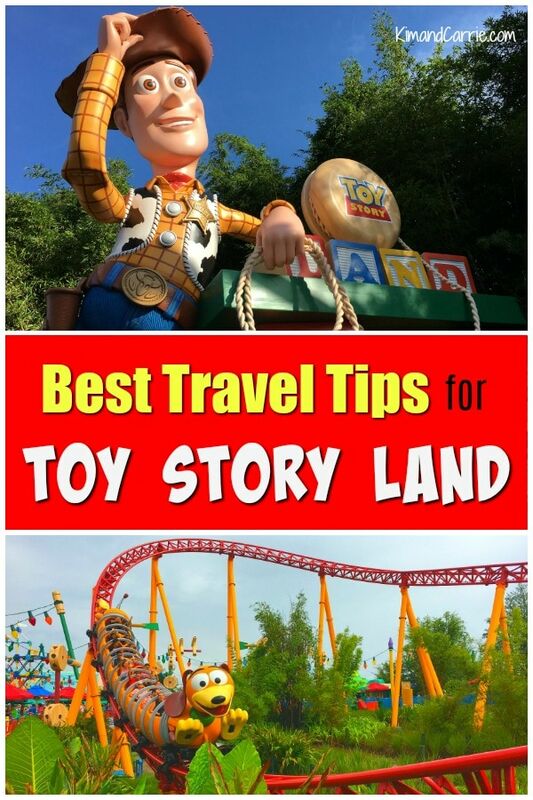 We can’t wait for you to experience it, too, so here are the best tips on how to experience Toy Story Land at Disney’s Hollywood Studios. 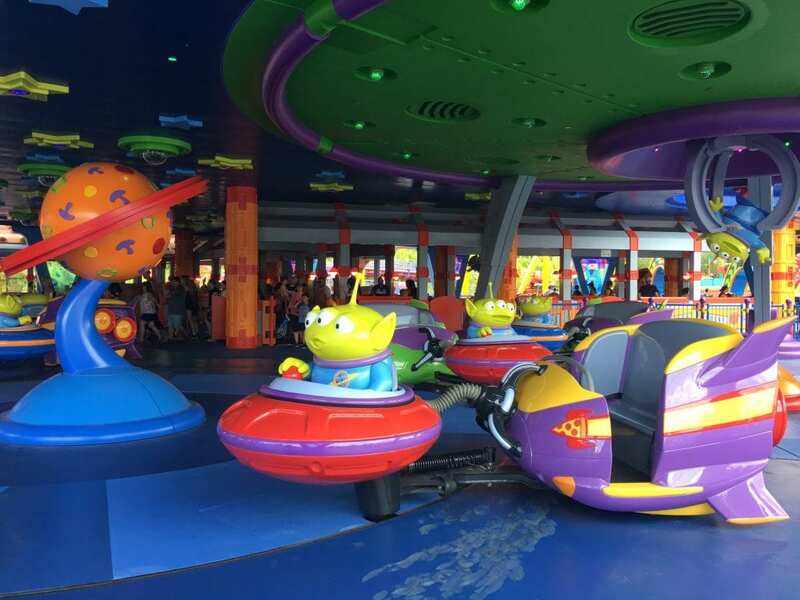 The two newest rides are Slinky Dog Dash and Alien Swirling Saucers. Toy Story Mania! has been at Disney’s Hollywood Studios for a while. 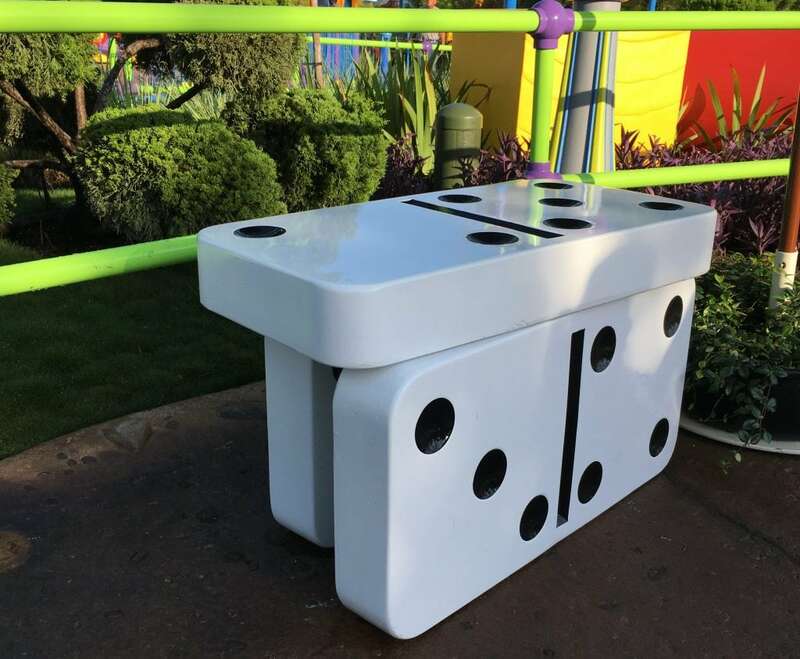 There was a third new track added to Toy Story Mania! in 2016. However, the old queue line entrance to the entire attraction is gone. Now there is a new queue line entrance for Toy Story Mania! in Toy Story Land. 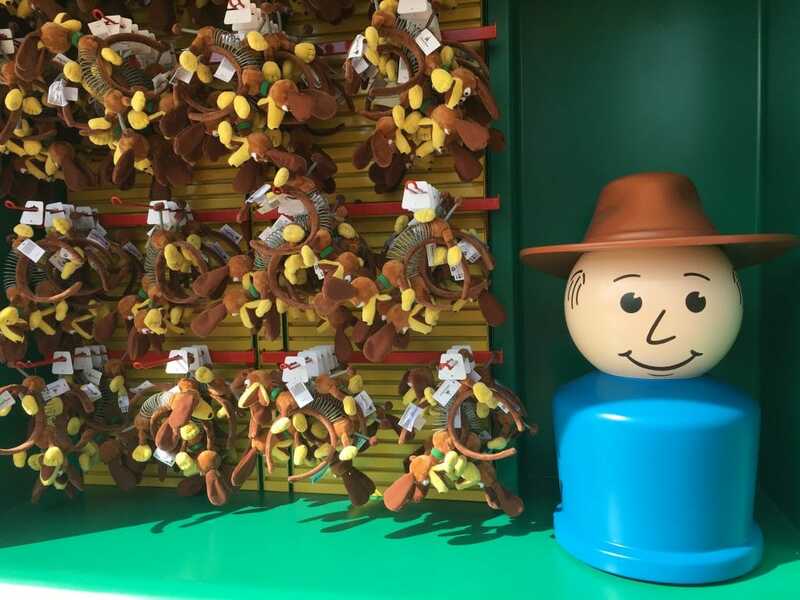 All three attractions in Toy Story Land are FastPass experiences. Which means that many of those FastPass times will be already taken by Disney Resort guests when the 30 day booking window opens for everyone else. Keep in mind that Toy Story Land FastPasses are for Tier 1. Which means you can’t get a FastPass for every Toy Story Land attraction all at once. You’ve got to pick and choose just one. And if it was us, we’d choose Slinky Dog Dash. 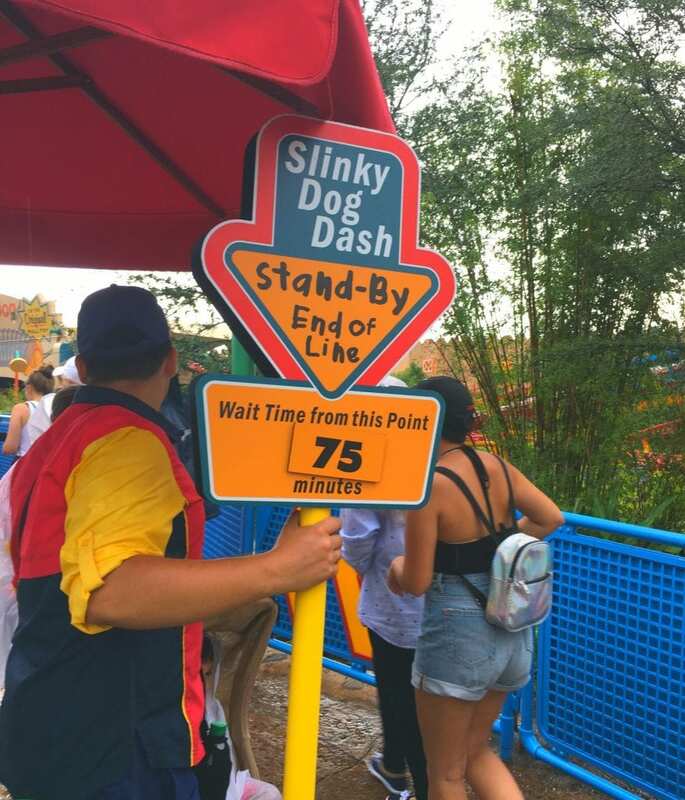 The wait times for Slinky Dog Dash are MUCH longer than for Alien Swirling Saucers or Toy Story Mania! Getting a FastPass for Toy Story Mania! is reportedly a little easier. There is no air conditioning in the queue lines for either Slinky Dog Dash or Alien Swirling Saucers. While there are covered queue lines, they are not enclosed. This family-friendly roller coaster can be seen all throughout Disney’s Toy Story Land. 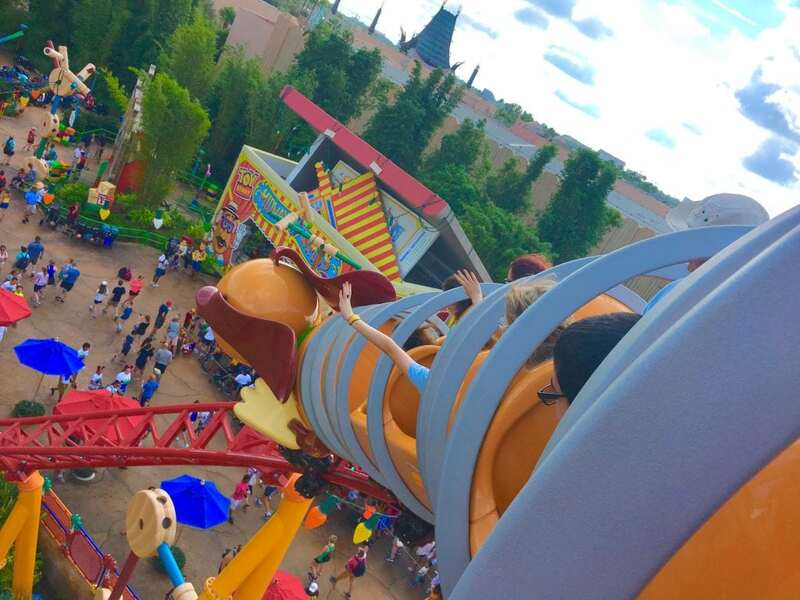 It’s hard to miss the big Slinky Dog flying through the air on the curving track. Seeing the smiling dog coming at you will likely bring a smile to your face – and have you wanting to grab a picture (or two)! 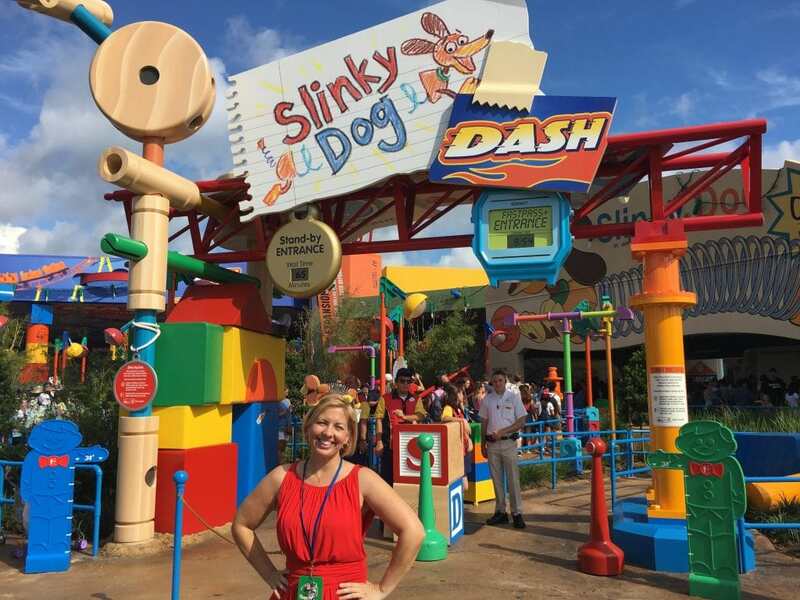 The Slinky Dog Dash Ride is a family-friendly ride. It is not as rough as Big Thunder Mountain or Expedition Everest. However, it is a roller coaster that does have some decent ups and downs, curves and drops. We say it’s a little faster than The Barnstormer roller coaster in Storybook Circus at Magic Kingdom. I definitely can’t ride rough roller coasters anymore. And while Slinky Dog Dash went a little faster than I was expecting, I was fine on this one. It’s a very smooth ride, which helps. There are 9 rows of seating in each Slinky Dog. There are two individual seats in each row. A small mesh bag pocket is provided in front of you to store your belongings while riding Slinky Dog Dash. 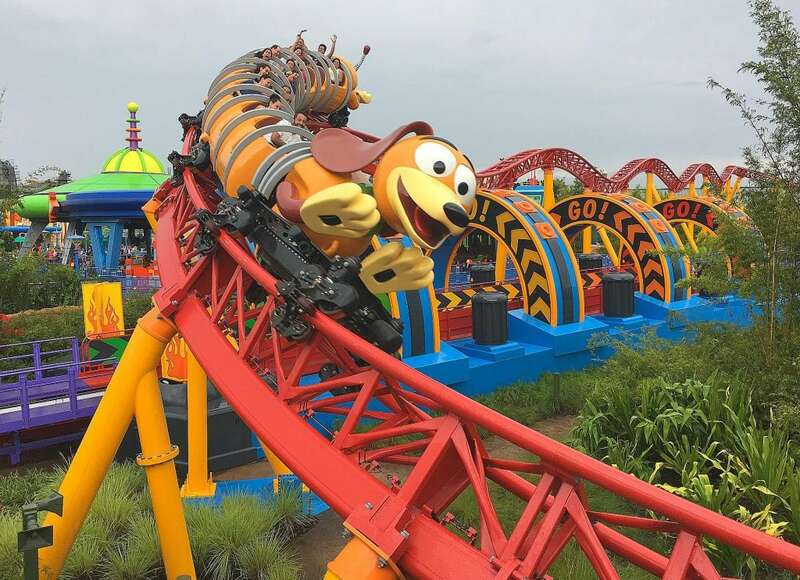 Guests must be 38 inches or taller to ride Slinky Dog Dash. 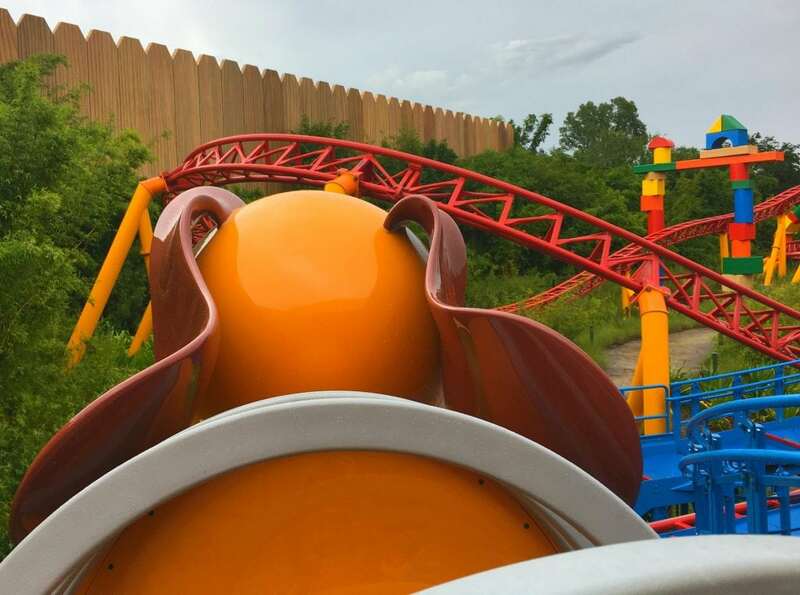 Riding in the first row is fun, but it doesn’t give you the great views of Slinky Dog like you will enjoy by sitting in the back. I rode in both rows 1 and 6. I enjoyed riding in row 6 much more because you can see the Slinky Dog head on the track in front of you and see what’s coming. Riding in row 1, you’ll have a limited view – see above – and miss the fun view of seeing the Slinky Dog stretch along the coaster track in front of you. This fun ride swirls you around on moving tracks in an alien saucer. The colors and music are amazing. And it’s fun to hear the aliens giving the safety spiel in their intergalactic voices. This ride was a lot more rough than I thought it was going to be! It is not dizzy like Mad Tea Party at Magic Kingdom, though. While a seatbelt is worn during the ride, you’ll be sharing it with the other members of your party. We were thrown around quite a bit on top of each other riding. But we weren’t holding onto the handle bars, either. So be sure to hold onto the handle bars to avoid being thrown side to side. You will be given a number to stand on in line. This does not mean that you have to find a vehicle with that number on it. Choose whatever ride vehicle you would like. There is no door on the sides of the vehicle. So be careful about your belongings inside. My purse fell over and emptied out. And the ride was shut down temporarily right before we got on because someone’s sunglasses flew out of the vehicle. So just make sure all loose belongings and items are in a bag or you can hold onto them. Children are not allowed to ride in a parent’s lap on the ride. 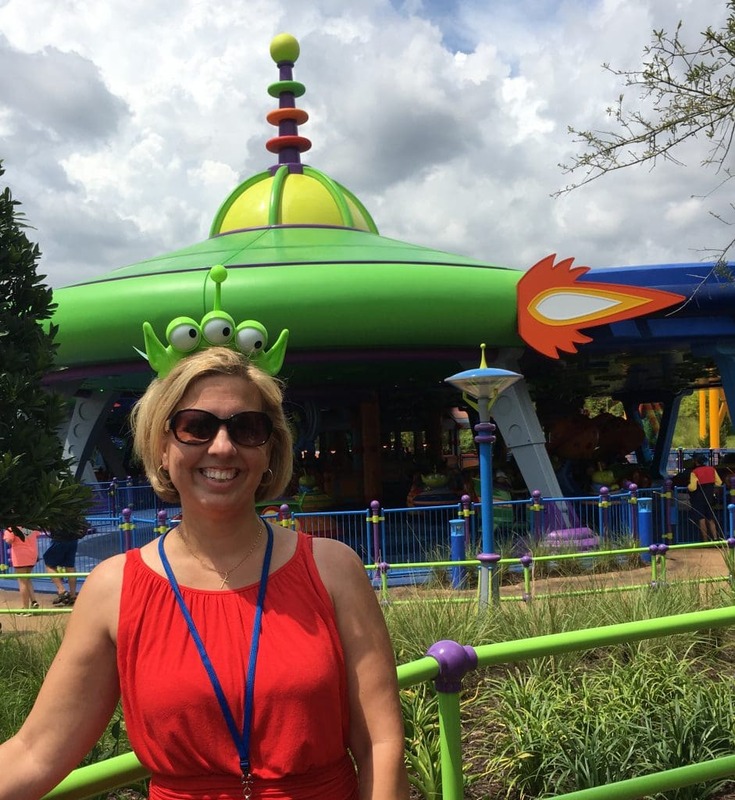 Guests must be 32 inches or taller to ride Alien Swirling Saucers. Toy Story Land is so colorful and imaginative that it is HARD to take a bad picture. Really hard, y’all. But there are some hidden spots and Instagram worthy locations that you’ll want to scope out for really cute pictures. Getting a great picture of the Slinky Dog Dash roller coaster doesn’t mean you have to ride it! 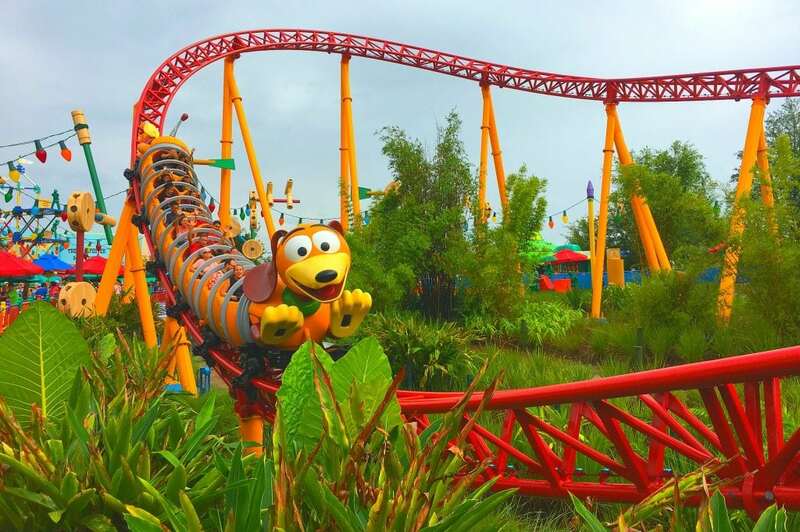 Some of the best photo spots for Slinky Dog Dash are along the roller coaster path. Just past the Toy Story Land entrance, on the right hand side behind the drink and merchandise carts, is a great place to get a picture of Slinky Dog coming down the roller coaster tracks. There is a lot of foliage here, so you’ll have to maneuver just right, but it’s super cute to see Slinky Dog coming towards you! With Slinky Dog Dash coming through every minute or two, you just need to wait a short time before you can grab a picture of Slinky Dog. Another great location for Slinky Dog Dash pictures is at the queue line exit for Slinky Dog Dash. There is a waiting area there where you can get two different pictures of Slinky Dog. You can get a picture of the roller coaster on the track coming around the curve. 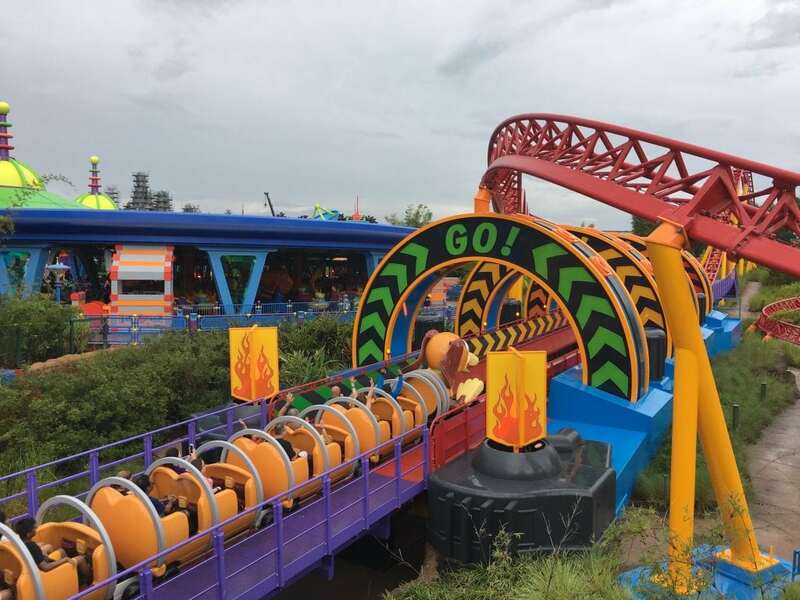 You can also get a picture of Slinky Dog before going through the GO signs on the roller coaster. The roller coaster actually stops and waits in this section, and then counts down with 3 beeps before accelerating. You’ll be able to position yourself for the photo and take it, without the blur of a fast moving coaster. One of the BEST tips for taking Slinky Dog Dash pictures is to use the burst mode on your phone to capture the photos. Don’t just take one photo and think you’ll have Slinky Dog in the frame. Often you’ll miss the best part. So start taking photos before Slinky Dog comes towards you and keep the burst mode on until he passes you by. 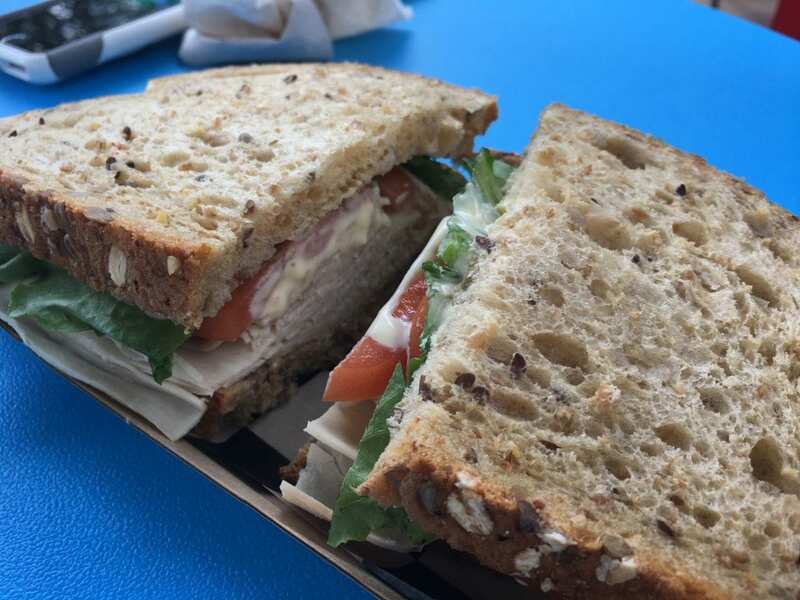 There is only one place to eat in Toy Story Land. It’s Woody’s Lunch Box. And it’s SUPER cute! 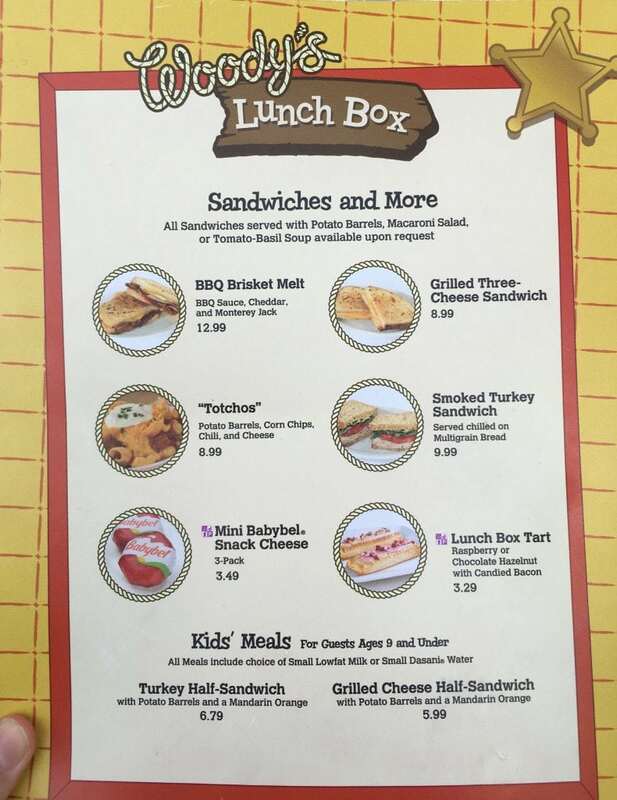 Woody’s Lunch Box looks like just that – a lunch box opened and propped open, with kid’s favorite foods served up. The quick service restaurant is open for breakfast, lunch and dinner. Menu items do change between breakfast and lunch (so, you cannot order a breakfast item during lunch time and you can’t order a lunch meal or sandwich during breakfast). The portions of the hot and heavy food for lunch were quite large! So keep that in mind when ordering. There is adorable seating outside of Woody’s Lunch Box. Some of the seats look like Babybel Cheeses opened up. The umbrellas are even made with Babybel wrappers. Babybel, by the way, is the official snack cheese of Walt Disney World. 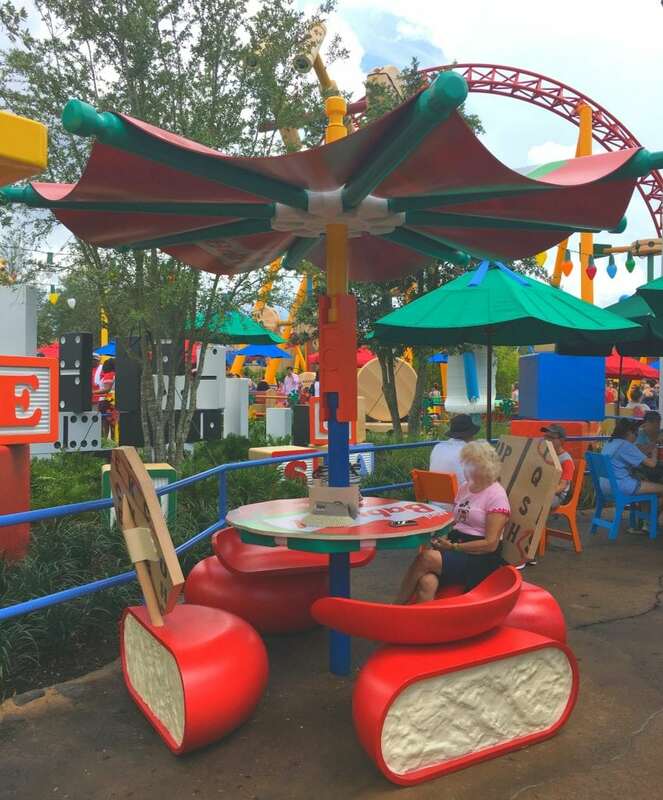 So you’ll see a lot of references to the snack-sized cheese in the food area of Toy Story Land. There are drink carts and popcorn carts in Toy Story Land for snacks. 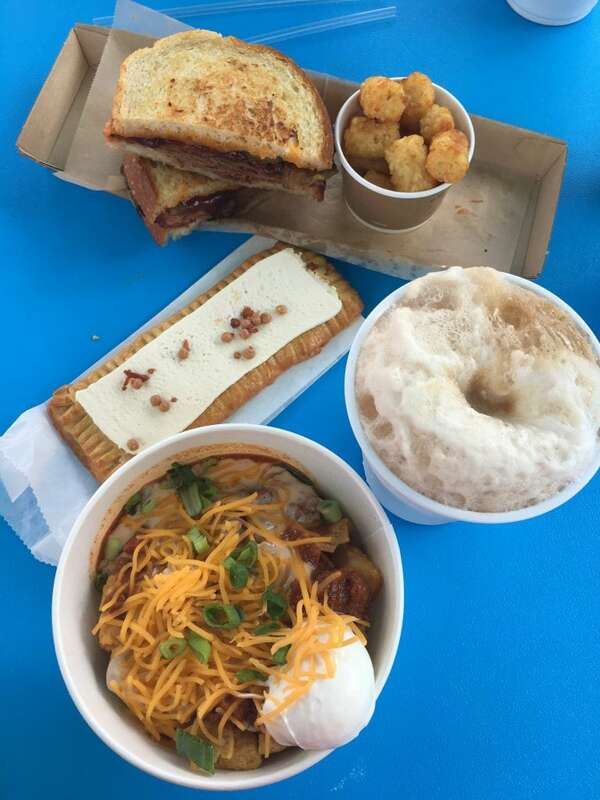 Disney’s Mobile Ordering is one of the best ways to save time on ordering food at Woody’s Lunch Box. It’s super easy. 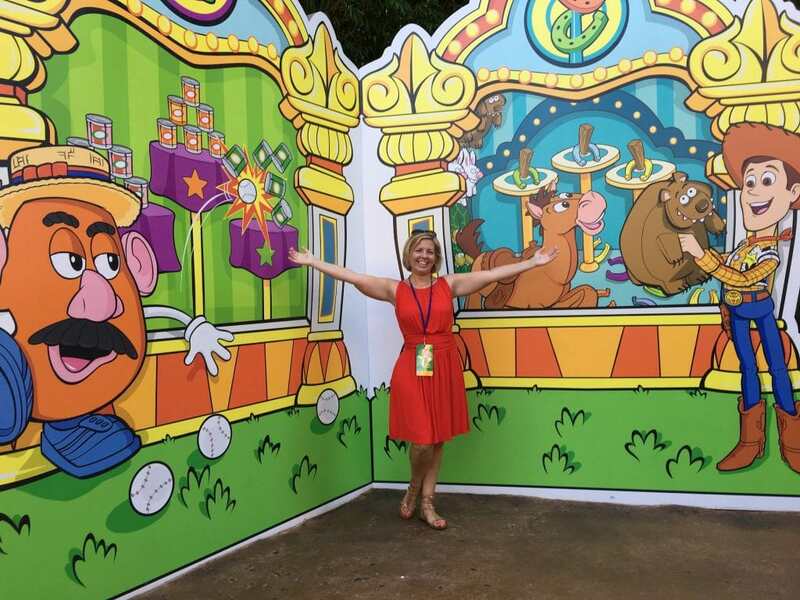 According to Tom Vazzana, Show Director/Creative Director at Walt Disney World, Toy Story Land purposefully has character meet and greets along the main walkways, so that you feel that you are immersed in a play land. 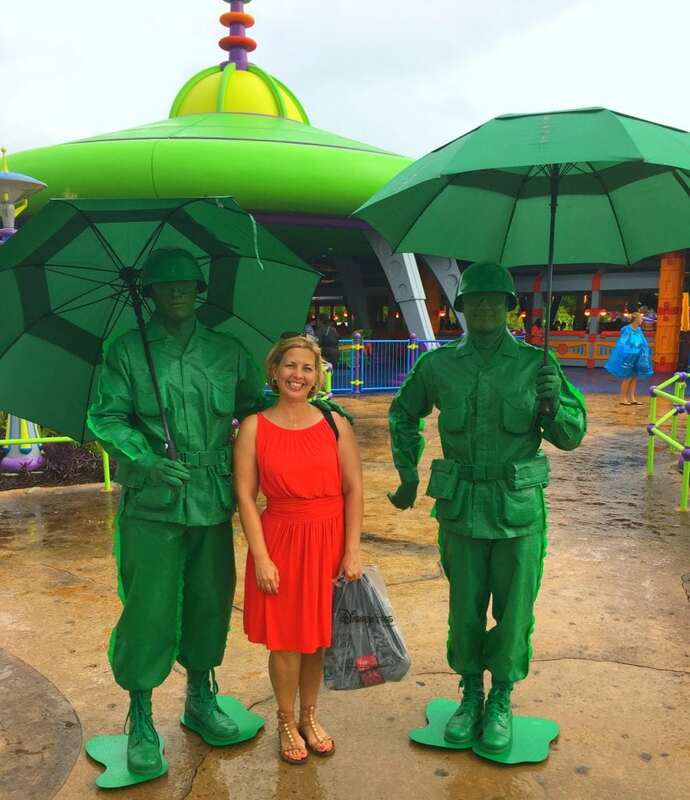 Which means that you can see Buzz Lightyear, Woody, Jesse and the Green Army Men easily while walking around. 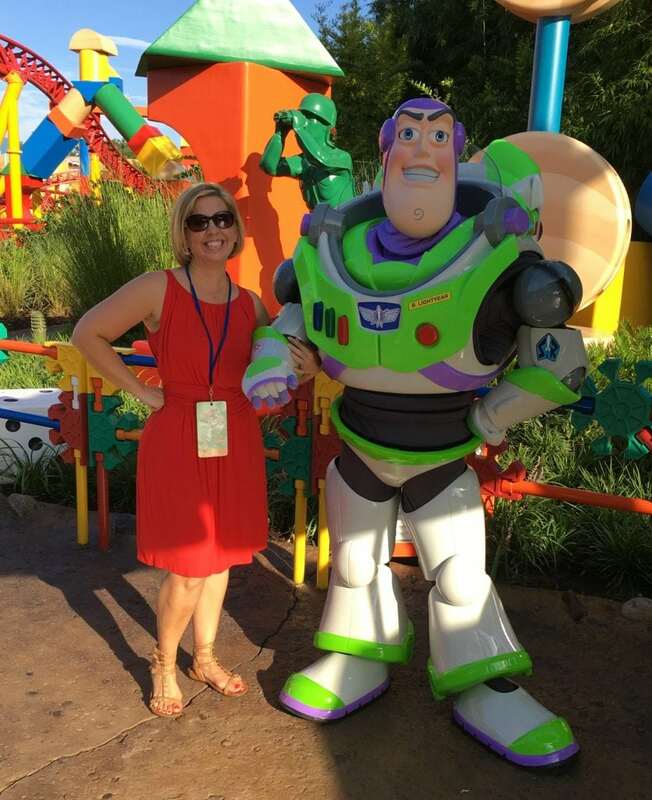 During our visit in July 2018, Buzz Lightyear had his own queue line. Woody and Jesse were doing a joint character meet and greet and had a dedicated queue line. 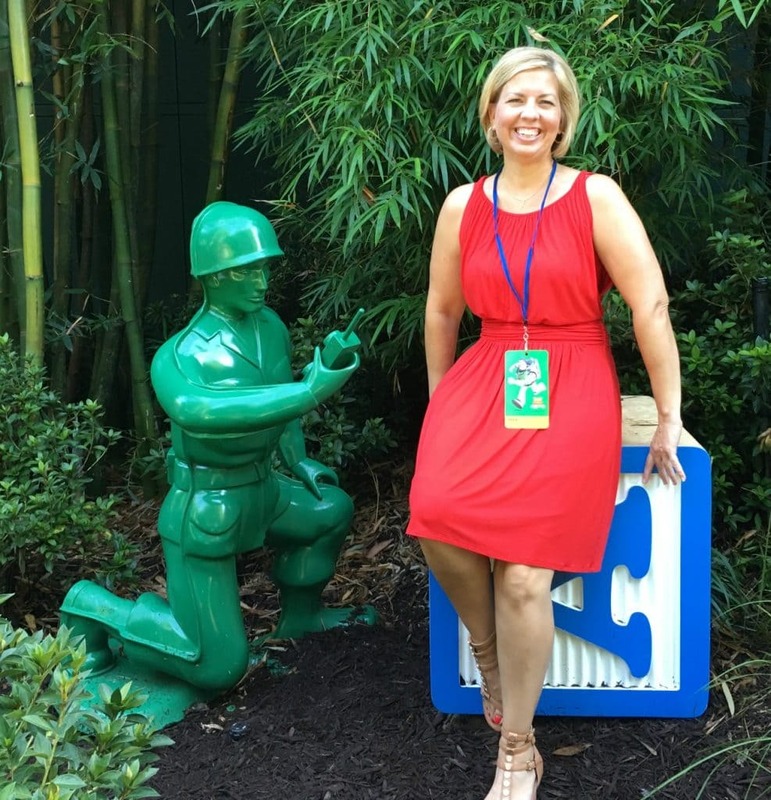 The Green Army Men were wandering around the land. You can just go up to them and get pictures taken. The Green Army Men do march through Toy Story Land with a drum corps. This march happens throughout the day. 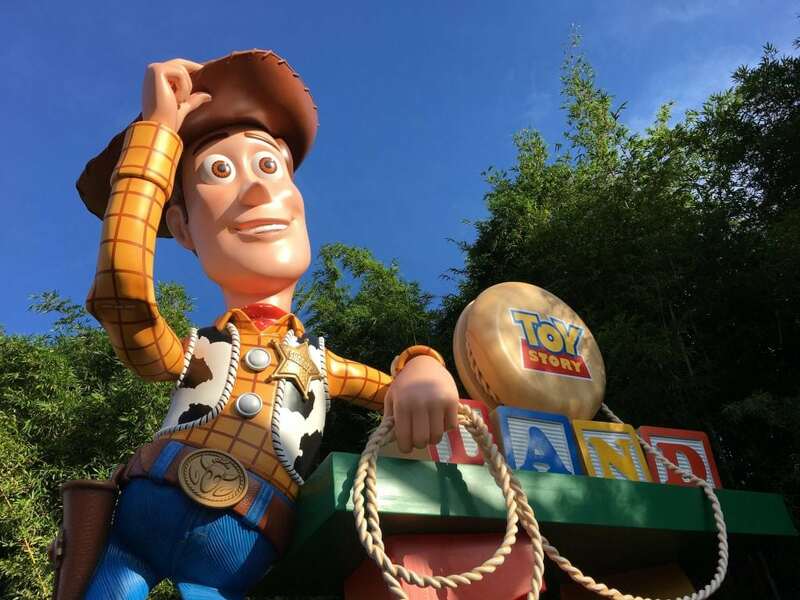 Be sure to take time to stop and enjoy the larger-than-life Woody at the Toy Story Land entrance and Buzz Lightyear outside of Alien Swirling Saucers queue line. These two toys talk frequently and it’s a fun character experience. 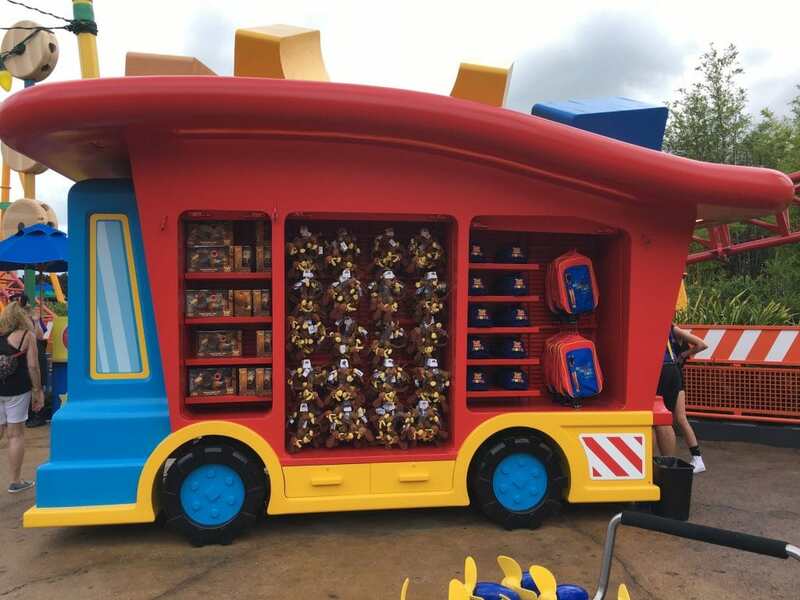 There are two merchandise carts in Toy Story Land. There is not a dedicated gift shop that you walk into. 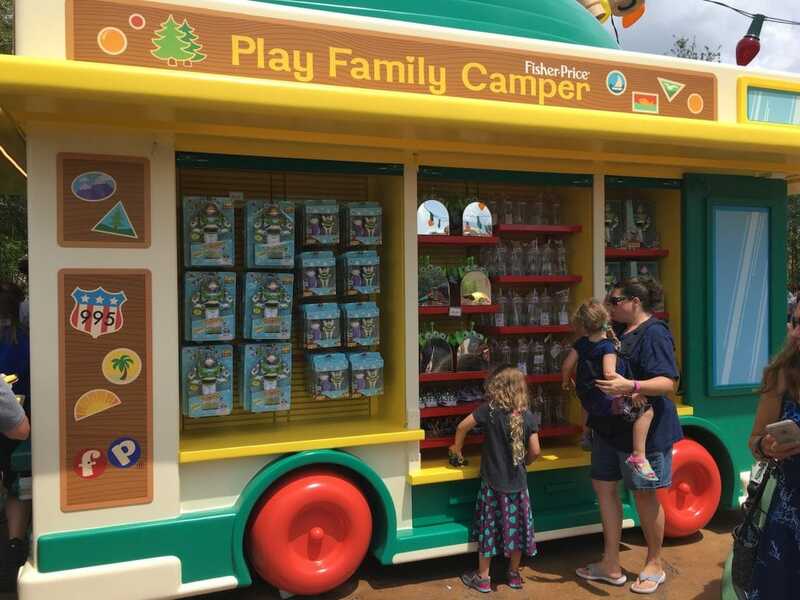 The Toy Story Land merchandise carts are playfully themed, as well. We loved the merchandise carts that looked like old Fisher Price toys. Slinky Dog ears are among the hottest merchandise in Toy Story Land. Along with Alien headbands. This new land is super cute, but it tends to get super HOT. 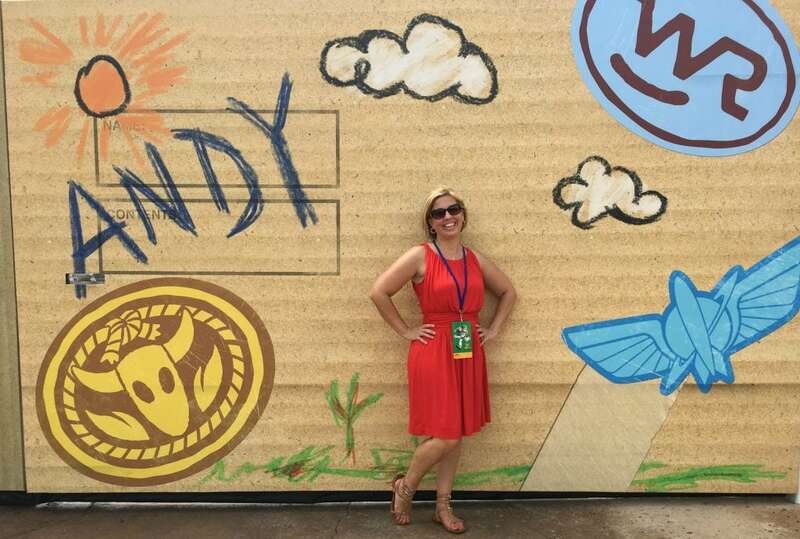 Since it opened June 30, 2018, we’ve only experienced Toy Story Land in the heat of summer (I can’t WAIT to see what it might look like with Christmas decorations!) The heat can be a real problem if you are not used to heat, have small children or elderly family members. Keep in mind, there is no air conditioning anywhere in Toy Story Land EXCEPT the Toy Story Mania! queue line. Be prepared with plenty of water (these are the best water bottles for Disney World), miniature fans, cooling towels, sunscreen, etc. Or visit Toy Story Land at night when the heat and humidity start going away. Everyone rushes to Toy Story Land right when Disney’s Hollywood Studios opens. So even right after opening, expect some traffic and lines building up. However, if you can get there ASAP at opening, your lines will be less than later on in the day. Toy Story Land is great at night! Everything is lit up and there is a different atmosphere. Consider visiting for pictures during the day, but waiting in lines at night. You’ll save a lot of time, but still get the colorful pictures. 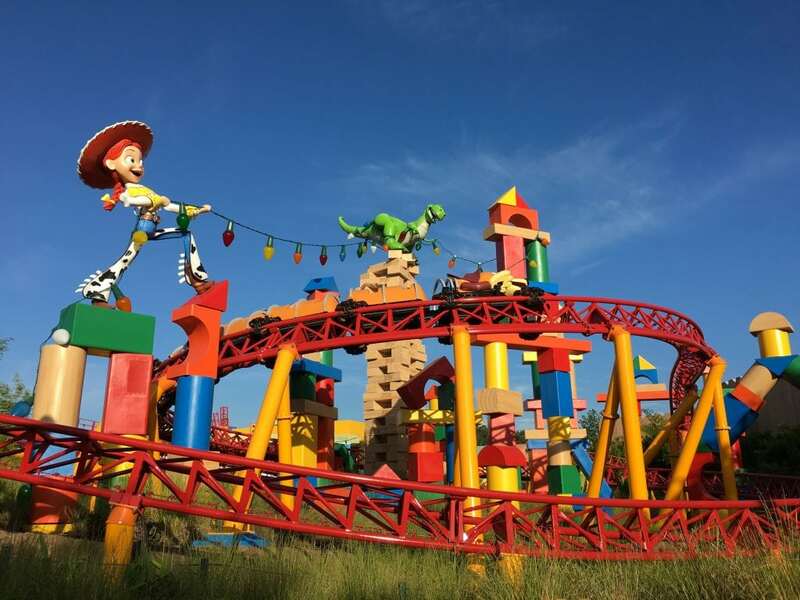 Choose to visit Toy Story Land during the week rather than the weekend while it is still brand new. The crowds are heavier on weekends and holidays right now. 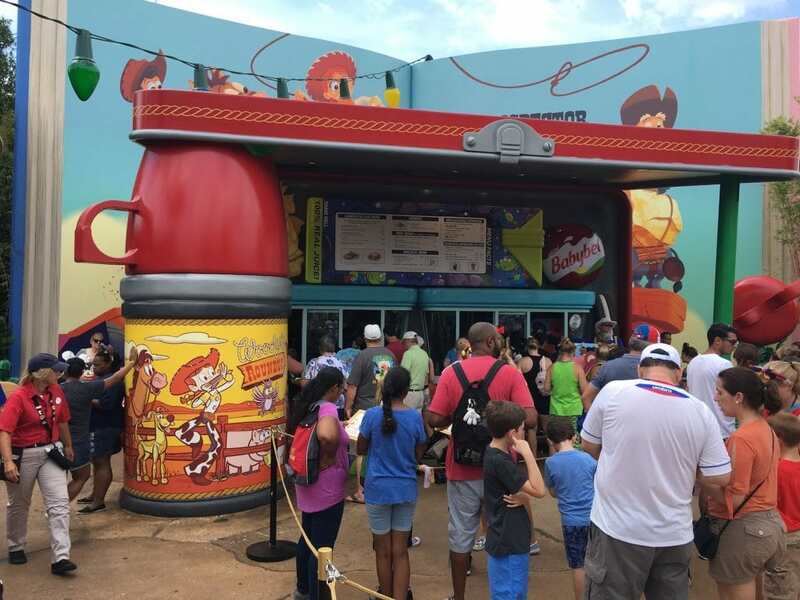 The opening of Toy Story Land means that the rest of Disney’s Hollywood Studios has very little lines – especially early in the morning! It’s a great time to see everything else there is to do in Disney’s Hollywood Studios with no crowds! Check out our Toy Story Alien Gelatin Cups recipe to make some adorable alien snacks for the kids!